If you haven’t noticed already, Facebook has given users a hint of the Timeline brand pages to come by quietly rolling out a Timeline Cover for Facebook Groups, made up of member’s profile photos. New! Easily see who is in the group. Now member photos are right at the top of the group – just click on someone to see their timeline. You can find the old group picture in the group’s photos. In the latest change, Facebook pulls eight group members’ Facebook profile photos and displays them prominently side-by-side on the top of a group’s page – a mimicry feature of the Timeline cover photos that top off your own profile. In addition to this feature, you can hover over group members’ images and click them, to be directed to the selected member’s Facebook profile. A feature that Facebook alludes to in the statement, “You can find the old group picture in the group’s photos,” may befuddle group administrators. 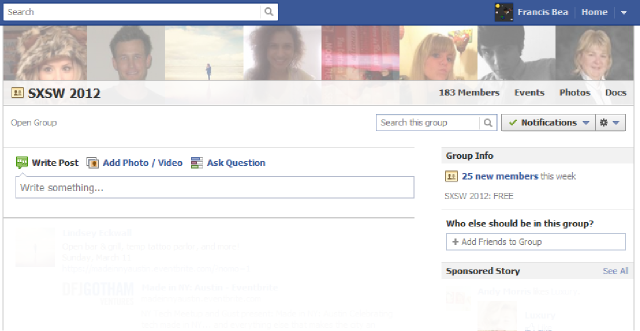 In fact, what Facebook is referring to is the option to add a Timeline cover-like image. Similar to personal profile Timeline covers, hovering over the top right corner of the group cover will reveal a tag labeled, “Choose a unique image for your group.” The accompanying button will direct you to upload, from your computer, an image wider than 400 pixels. While Facebook could have asked administrators to outright upload images to a group’s cover, knowing well that many groups exist without uploaded images in its library, they’ve cleverly decided to call on member photos instead. After all, members having a stack of pictures to draw from is a near guarantee. Bordering the bottom of the banner, there’s a minor yet effective navigation update. The group page’s translucent navigation bar encourages cooperation and productivity by granting an easy-to-access suite of features including photo uploads, event scheduling and document creation. While there was a point in time when users and brands had trouble distinguishing a Facebook Page from a Facebook Group, the latest change is a successful step in rebranding Facebook’s group pages into an intimate, collaboration platform. Could this be the precursor for Facebook’s purported release of Timeline for Facebook Pages? It looks to be that the rumor of its launch at the end of February may be more than just a rumor.